Protestors made signs promoting love ahead of the demonstration on Castle Hill. A group of 20 Lincoln residents reacted to the recent election of Donald Trump as the next US President by staging a peace gathering on Castle Hill. Stating that the election of Donald Trump on Wednesday, November 9 has created ripples of ‘despair, fear and hatred’ in their local community, protestors lit candles among a number of large peace signs on the evening of November 13. The group sat, held hands and welcomed passers by to join them in discussing the upcoming presidency. 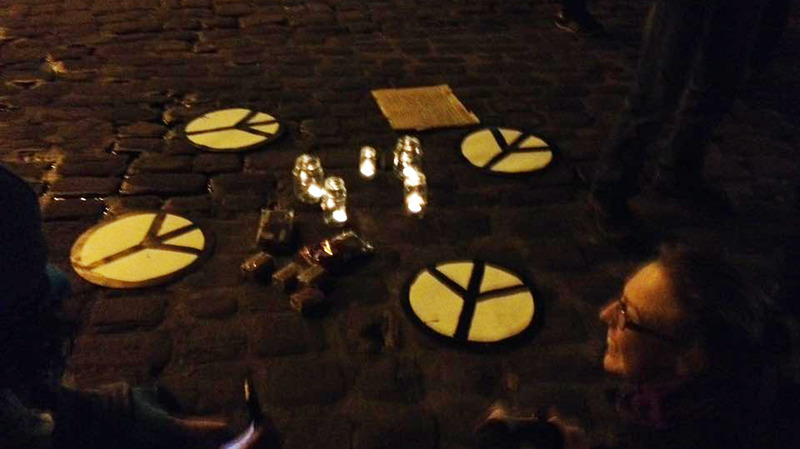 The group sat in a circle with candles and peace signs to discuss the presidential transition. Lincoln resident Jade Clarke explained that she saw many people expressing their opinions and fear on social media after the result. She said: “There was a strong tone of despair. In order to help people feel less negative and isolated, I felt it was necessary to organise a gathering in order to share support and hope. “When people who believe in the same thing come together, they empower one another, whereas social media can create isolation. “America is a huge global player and most decisions made in America have a profound impact upon the rest of the world, particularly since the world is becoming more globalised. “The world over should express their opinion on the result. The people who gathered in Castle Square displayed fear for what may happen during President-Elect Trump’s term in office. A local student who took part in the event, named as Emily, said: “Since returning from America and making some close friends there, I know the profoundly negative impact that Trump is having. The group will be meeting again on January 20, the day of Donald Trump’s inauguration.